Next, I visited the Craft and Quilt Fair. I guess all the quilting fabrics are released by American companies, so they concentrate on the big Quilt Con events that happen each year over there. This leaves very little that is new or different emerging at the craft shows in Australia. Maybe we should be using these events to celebrate Australia's contribution? I saw very little in the way of this – where was Gardenvale by Jen Kingwell, and her new book Quilt Lovely, or Emma Jean Jansen's most recent range? They are both based in Victoria so maybe they wait for those shows? Anyway, I left feeling like I'd just visited a large shop, rather than seeing anything inspirational that was going to spark creativity. There was one exception to this – the NSW Embroiderers' Guild installation 'Stitched Circles'. This pic is via the guild's Facebook page, and if you click on it, you'll be sent over there to see each of the circles in all their glory. What an amazing effort. Mary Brown gave all the guild members a brief and a colour palette to work with, but the variety of textile art that has resulted is astonishing. 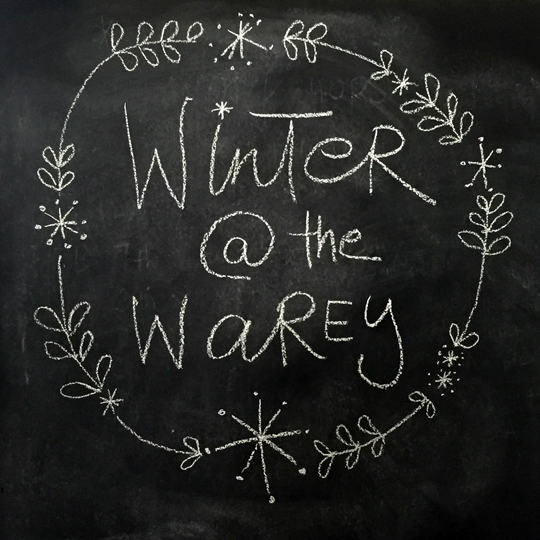 My last crafty visit was to Winter at the Warey – check out that hashtag on Instagram. 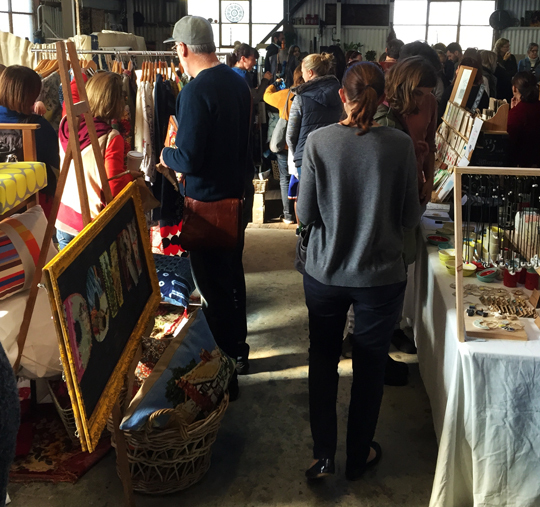 These markets are the brainchild of Cath from Prints Charming and Caroline from Allitera, who throw open their shared studio in Annandale to a bunch of independent designer/makers selling their wares in a bi-annual market. There I met Genevive Edmonds from 5 Stitches who creates fabric stitched cards, and printmaker Fiona Roderick. I have to confess I was attracted to her work on behalf of my bird-obsessed niece, but I love her use of colour and line. I also had a stickybeak at the work of Michelle from You Are Brave – sadly she wasn't manning the stall when I was there, and the blueprint ceramic series from Lesley Hunt of Huntseek Design. Of course I also had to pick up a few things from Prints Charming... I feel some embroidery coming on! Follow Cath or Caroline online to see when the next market will be – in about six month's time. Well worth a visit and perfect timing for the Christmas shopping. And have I done any work myself? The short answer is 'no'. But I've been doing a lot of reading along with the talking, which has led to a lot of thinking about the rest of this year and beyond, the direction I want to go and the work I want to do. I've been reading 'Art Inc' by Lisa Congdon and 'This Changes Everything' by Naomi Klein. Lisa’s book is about all the ways you can make a living from your art. It’s a great resource for anyone starting out, or a bit stuck for new avenues to explore. It covers all aspects of running an arts-based business and includes a ton of case studies which always help me to see how I could do the same. Lisa also has a great Instagram feed if you're interested. Naomi Klein’s book answers the question why, when we know what climate change is doing to our planet, and the majority of us agree that we’re causing it, we seem incapable, after thirty years of talking about it, to do anything to stop it? At the heart of her thesis is the argument that doing something about climate change threatens the very consumerist, economic-growth-at-all-costs, capitalist system we now take for granted as the only way of doing things. It’s a powerful, if dense, read and is really bringing together a lot of the things I’ve been thinking and writing about lately – slowing down, minimalism, experientialism, and the shocking damage being done to people and our planet by the textile industry. You can see why I might be paralysed about where to go from here. The paradox that the very act of creating is adding to the pile of stuff that nobody needs. Is it possible for me to make a living out of teaching and writing about my craft, or can I feel comfortable creating quality pieces that take time and use the greenest materials available then release patterns that allow others to do the same? What a week you've had! wish I'd been there to share some of it with you. I'm glad you balanced the "brain drain" side of it with lots of artistic inspiration. Whoa! You have been busy Tara! Sorry to have missed you at Winter @ The Warey ... but so glad you came by to support this awesome group of Sydney makers. It was such a great day. Catch you soon. Enjoy your making! 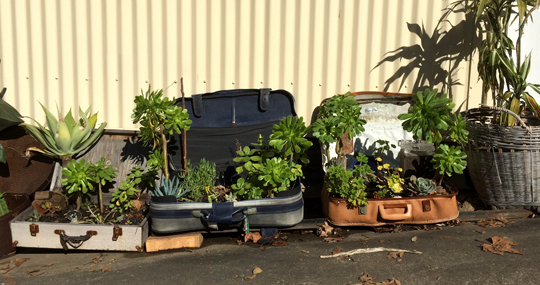 So glad you found so many crafty things to do in Sydney.